Complimentary Photo Finish Pore minimizing Primer (7ml) & a Classic Primer(7ml) on Smashbox orders worth Rs. 1900 & above. Offer valid till stocks last. This oil-free, mattifying face primer instantly blurs flaws, reduces the appearance of pores and controls oil for up to 8 hours. Photo Finish Pore Minimizing Foundation Primer works for all skin types but is ideal for oily and combination skin. It pairs best with liquid or cream foundation. This primer is non-acnegenic and ophthalmologist tested. 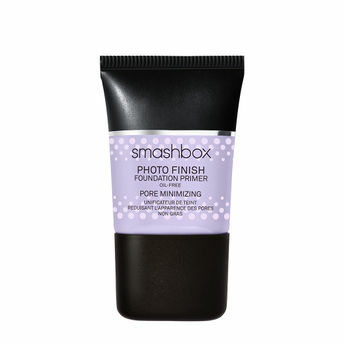 Smashbox Photo Finish Primers got a makeover! It’s the same formula you’ve always loved, just with a fresh new look. Now it’s easier than ever to find a primer that’s perfect for your skin needs. Explore the entire range of Face Primer available on Nykaa. Shop more Smashbox products here.You can browse through the complete world of Smashbox Face Primer .Alternatively, you can also find many more products from the Smashbox Photo Finish Foundation Primer Pore Minimizing range.